The ’90s are back. But not really. On Friday, the New Yorker published a piece declaring that the style popularized by Fran Drescher on The Nanny has quietly made a comeback as a kind of subversive, feminist stance against rigid style rules. My personal point of view on that is that Drescher’s style has always been enviable, and that blazers, black turtles and coffee-colored tights have always been universally flattering. Or in any case, they swing back into popularity every fall. In general, I am skeptical whenever I hear that the ’90s are making a comeback: I think there are things about the ’90s that have always been cool (camo jackets, low unemployment) and there are things about the ’90s that were never cool (tiny sunglasses, bootcut jeans) but that celebrities seem to insist on wearing. But I don’t think we really want the ’90s to come back. That lawless, aggressively normie time can stay squarely in the past. A perfect example of this tepid toe-dipping into ’90s fashion is the Rachel haircut. 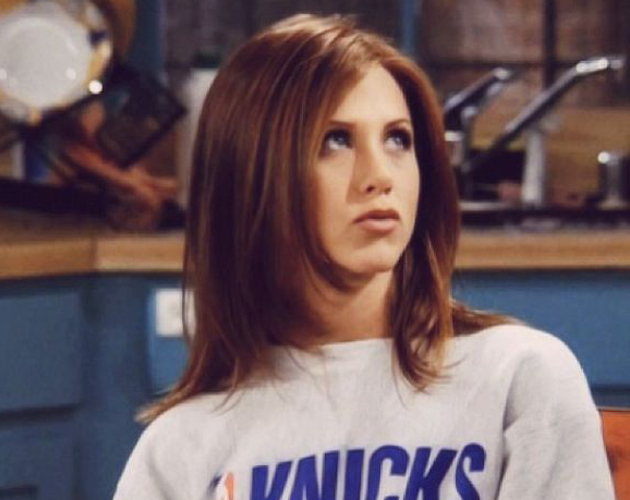 If you watched Friends, you’ll remember the Rachel is the sleek, shoulder-length hairstyle that Rachel Green (Jennifer Aniston) wore on and off throughout the series. Compared to the beachy waves that dominate the heads of Hollywood elite today, the Rachel is understated and low-maintenance—even plain, even boring! But it has appeared recently, with some minor but crucial variations, on the heads of models like Kendall Jenner, Bella Hadid, and Emily Ratajkowski. In any case, it always disappears. Hadid recently got bangs, so even though her layers are still long enough to frame her face, her flirtation with the Rachel haircut is pretty much over. For now. In the pic above, Jenner is leaning hard into a Rachel-esque haircut, but she typically keeps her hair parted in the middle and pulled back or down and pin-straight. Ratajkowski has hints of the Rachel in the photo above, but it’s more of Mischa Barton in the O.C. type of thing in terms of length and layering. The Rachel is not getting a full-fledged revival—at least, not right now. And that’s fine! The ’90s can stay in the past, because it’s 2018 and I hear buzzcuts are in, and tomorrow, something else will be cool. We don’t need to do this. Fashion is cyclical, but also beats on, boats against the current. F. Scott Fitzgerald was right. What Will Be The Next Terrible Trend To Resurface During The 90&apos;s Revival?